Children up to age 12 are invited to play Monday – Friday, 4pm-8pm and Saturday, 10am-2pm. Admission is $3 per child (parents do not pay). Contact the park for more information (317) 327-7191. There was ample parking in front of the building. Bathrooms are located in the entry area, away from the Sensory Room. You’ll pay your admission at the front window and the parks staff will lead you to the sensory gym where you’ll find a clean space with activities for many abilities. My children ages 18 months, 3 and 5 really enjoyed the different kinds of swings, including one that you can climb and the ball put. My 3 year old and 18 month old loved the sensory activity wall and the trampoline. My 5 and 3 year old loved the climbing wall, the balls and the balance beams. There was a very cool Ladder Light feature that we’ve never seen before. 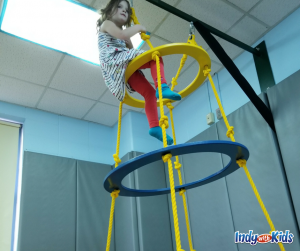 For other indoor play places in Indy, check out our list.